Extracts from "Wanderings in Burma"
Although the English acquired a footing in Burma as early as the year 1687 by taking possession of Negrais, it was not until alter the expedition of Sir Archibald Campbell in 1826, that chaplains were appointed to administer to the British troops stationed in Burma, whilst the first Church of England missionary entered upon his work in this country in 1859. In 1855 Bishop Wilson, after visiting Akyab, landed in Rangoon on the 15th November. Six days afterwards Lord Dalhousie, the Governor General, arrived and after consultation it was agreed to build three churches to cost Rs. 35,000 each, to have one church in Rangoon and burial grounds at all European stations. From that date the Anglican Church in Burma has been under regular Episcopal supervision. Chaplains were appointed to Rangoon, Moulmein, Thayetmyo, Toungoo and Akyab, with the primary object of ministering to the British troops stationed in those towns and it was not until the year 1856 that practical steps were taken for entering upon direct mission work. Principally through the exertions of the Rev’d. C.S.P. Parish, Government Chaplain at Moulmein, a sum of Rs. 7,000 was collected and the Society for the Propagation of the Gospel in Foreign Parts, on being appealed to, resolved to commence the mission with two ordained missionaries and trained schoolmasters with head quarters at Moulmein. Rev’d. C.S. Shears, M.A. of St. John’s College, Cambridge, reached Moulmein at the end of April 1859. There was associated with him the Rev’d. T.C. Cockey, of Bishop’s College, Calcutta, who spent some time in Burma. Mr J.E. Marks arrived in 1860 and took charge of the mission school, which, under his energetic management, soon advanced both in numbers and efficiency. In 1862 Mr Shear’s health having failed, he returned to England and the Rev’d. T.A. Cockey was transferred to Cawnpore. ​ In November of the same year Mr P. Marks joined his brother at Moulmein. The Rev’d. J.E. Marks returned with the Rev’d. H.B. Nicholls, M.A., formerly a missionary in New Brunswick, who had been appointed to the Burmese mission. His term of service was short, for being attacked with brain fever, he died on 10th December 1865. In the beginning of 1864 Mr Cooper arrived and took over charge of the school, the Rev’d. R.W. Evans having again been in temporary charge. Mr J. Fairclough of St. Augustine’s College, joined the mission and was ordained deacon in the month of December 1866. At an early date in this history, a girls’ schools for natives were opened, both in Rangoon and Moulmein. Chiefly through the earnest representations of the Rev’d. H.W. Crofton, Government Chaplain, the Society resolved in 1862 to establish a mission at Rangoon. In December 1863, a large and influential meeting was held to make known the ants of the mission and as a result within a few days a sum equivalent to £570 was contributed. Early in 1864 the mission was opened under the leadership of the Rev’d. J.E. Marks. The foundation stone of this, the largest S.P.G. school in the country, was laid in March 1869, by General Fytche and the school opened for pupils on 26th October of the same year. Government contributed Rs. 2,000 towards the cost of building, on condition that a similar sum was provided by the Society. About Rs. 2,000 which had been expended on another site, was allowed by Government to stand as part of this sum. The rest was supplied by the Calcutta S.P.G. committee from funds in their holding, which had been chiefly collected in Burma. Large additions have been made to the premises since they were opened. - was separated from Rangoon and made a distinct mission district in 1977 under the charge of the Rev’d. James A. Colbeck, and Pazundaung, to the east, was made a mission district under the Rev’d. J. Rickard in 1883. In 1869 the Rev’d. J.E. Marks , on the invitation of the King, proceeded for a second time to Mandalay. ​The King built a school-room, clergy house and church for the mission and for some time showed his favour towards it. Her Majesty Queen Victoria presented a font to the church. This was consecrated by the Bishop of Calcutta on the 31st July 1873. The school proved highly successful and Mr Marks continued at Mandalay until January 1875, when the Rev’d. J. Fairclough took over charge until March 1877, being succeeded by the Rev’d. C.H. Chard. Towards the end of 1878 the mission was in the hands of the Rev’d. J.A. Colbeck, who was compelled to leave Mandalay at the close of 1879 with the British Resident and the other Europeans. By the very first passenger vessel proceeding after the annexation the Rev’d. J.A. Colbeck returned to Mandalay and re-opened the mission. A desirable site being secured, a new mission was opened in this important centre by the appointment of the Rev’d. Francis William Sutton (M.R.C.S. Eng.) in 1887. Mr Sutton’s health failing, he had to resign his appointment in 1889 and return to England, the Rev’d. H.M. Stockings taking over charge of the mission. A new mission was opened in this town by the appointment of the Rev’d. J. Tsan Baw in 1890.
endowment were made by the Society for Promoting Christian Knowledge, by the Society for the Propagation of the Gospel in Foreign Parts and by the Colonial Bishopric Fund. A large portion of the endowment was raised in the Winchester Diocese as the result of a meeting held at the house of Sir William Farquher, Bart., on the 7th October 1875, when it was resolved that £10,000 should be raised for the purpose. As a perpetual memorial of this, part of the Episcopal seal of Winchester appears in that of Rangoon. Bishop Titcombe worked indefatigably through with impaired health and amidst much domestic affliction, when on a visit in the Karen Hills, he slipped over a rock and received injuries from which he never recovered. He resigned the Bishopric early in 1882 and the present Bishop, the Right Rev’d. T.M. Strachan was appointed, having been consecrated in Lambeth Palace Chapel on 1st May 1882. In 1887 fresh Letters Patent were issued extending the boundaries of the Diocese so as to include all additions made to the Empire by the annexation of Upper Burma. 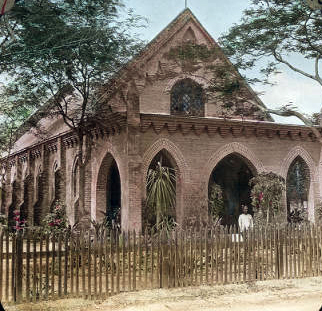 The first English Church built in Burma was that of St. Matthew’s at Moulmein. It was erected in 1832 and was replaced by a new and very handsome structure in 1890. ​The C. of E. Cathedral, Pagoda Rd. R.C. Garrison Church, Pagoda Rd. C. of E. Garrison Church, Godwin Rd. Presbyterian Church, Signal Pagoda Rd. R.C. Convent Chapel, Commissioner's Rd. Methodist Episcopal Church, Fraser St.
missions to keep alive and to further spread Christianity in Burma, form an interesting page in the history of the country. The so-called native Christians found in the districts of Yeu, Shwebo and lower Chindwin are the descendants of those Portuguese and natives of India taken prisoner in 1614 when Phillippe de Britto was captured and his colony at Syriam broken up. The bulk of his followers were transported to Ava and settled down in villages on the banks of the Mu. The tolerance of their Burman conquerors permitted them to retain their own religion. These Christians were recruited by other captives taken prisoners when Alaung-pya again conquered Syriam and subsequently the capture of Yodia or Yuthia, the Siamese Capital, by Sin-Byu-shin, brought a further addition as the conquerors carried back with them the Vicar Apostolic and part of his flock from the latter place. ​How the Christians fared after the transportation to Upper Burma we have but little information till in 1719 the first missionary of the Barnabite Mission arrived. He died in 1727 and was succeeded by Fr. Jallazia, who built a church in Syriam. In 1743 he ​returned to Burma as the first consecrated Bishop of Elisma, in partibus. In the troubled times that followed the Bishop was killed and when after the capture of Syriam by the Burmans, the Christians living there were transported to Upper Burma, the missionaries still clung to their flocks and Bishop Percoto, who succeeded, followed his people to Upper Burma and eventually died in Ava in 1776. Among the best known of the Barnabite Fathers was Fr. San-Germano, who arrived in Burma in 1783 where he remained till 1806. ...called St. John's Leper Asylum occupies an advantageous site in the Manaw-Yaman Royal Garden and is connected with the R.C. Mission. The Asylum was started by Fr. Wehinger about four years ago and at the present (1879) time contains about 150 patients. It has received liberal support from the charitably disposed in Upper and Lower Burma and the zealous superintendent is now on a mission to Europe to collect funds for the extension of the work of the Asylum. The Presbyterian community in Burma is small and is affected by any change in the garrison of the military posts. The Presbyterian Church was first established in Rangoon in 1873 owing to the exertions of the Rev’d. G. Fordyce and the present church was built in 1875. In 1884 the church was affiliated in the Presbyterian Church of England. In 1885 new ground was broken. Hitherto the Church had not attempted any mission amongst the natives of the country, but in that year a mission to the Chinese was begun and attended with some success. In 1884 the Minister of the Kirk was recognised as Acting Chaplain to the troops. The following account of the American Baptist Mission is extracted from the authorised history of the Society. The history of the Karen race for the past fifty years is so intimately connected with the foundation and success of the A.B.M. that any account of the Karens and Baptist Christians amongst them would be unintelligible without a brief narration of the efforts of these missionaries who have done so much for their moral and intelligence as well as their religious welfare. The A.B.M. has a long record of good work. The large numbers of converts it can show are not the results of any spasmodic effort, which may at any time die away, but the Baptist Mission has now become an integral part of the religious life of a large and yearly increasing section of the population in the country and no excuse is necessary for entering at some length so important a part in the national life of Burma. To Marsden and Chater and the Baptist Mission of Serampur belongs the credit of establishing the first Protestant Mission to Burma. In 1807 they first reached Rangoon, where they found Roman Catholic Missions already established and were kindly ​​received by the priests of the mission. Next year Dr. Carey’s son joined the mission. In 1809 a mission house was built and in 1803 Dr. Carey went to Ava starting just four days before the arrival of Messrs. Judson and Rice, to whom, on his return Dr. Carey transferred the Mission. The A.B.M. was founded by Messrs. Judson and Rice, who, disappointed in their design of working in India, finally landed in Rangoon on the 14th July 1813. From the very first the missionaries met with opposition but nothing daunted the mission, now with several new members, set up a printing press in Rangoon in 1816. Troubled times followed, but the tact of their medical missionary, Dr. Pryce, for a time brought them into favour with the Burmese court. In 1824 when war between the British and the Burmese broke out and not altogether unreasonably, the Burmese could not distinguish the British from the Americans. Messrs. Hough and Wade, who were then living in Rangoon, were seized, but were rescued on the fall of the town into the hands of the British. Messrs. Judson and Rice, who were with their wives at Ava, were imprisoned and were finally used as intermediaries when the Treaty of Yandabo was concluded in 1826. The annexation of Tenasserim and Arakan opened new fields of labour. The mission was started in Tavoy by Mr Boardman. He it was who first turned his attention to the Karens. Hitherto, as might have been expected, the mission was purely to the Burmese. But the conquest of the Burmese had brought into prominence the hitherto down trodden race of the Karens. The success that attended the new departure at once pointed out to the missionaries where they would most readily find converts. Mr Boardman died in 1831 but his work was carried on by Dr. Mason. In the same year the mission at Kyaukpyu was formed by Mr Wade. In 1834 Mr Judson finished his translation of the Bible into Burmese but civil war and anarchy at Ava and the dread of a new war with the British induced the missionaries in Rangoon to transfer their schools to Moulmein, Akyab and Sandoway. Here other missions to the Karens were opened. But though their success was at the time great and Karens flocked across the passes of the ​​Arakan Yomas to join their countrymen who had already escaped from the tyranny of Burmese rule in Pegu and readily became converts, the deadly climate of Arakan proved fatal to the missionaries and one after the other succumbed and in 1852 the ​conquest of Pegu by the British once more opened the way to re-establishing the mission at Pegu. Missions were accordingly opened in Toungoo, Rangoon and Bassein. From the very first the Karens flocked to the missions. In Toungoo especially the labour of Dr. Mason and his coadjutors met with astonishing success and there were in 1891, 22,313 Baptist Christians in Toungoo alone, of whom 11,957 were natives. In 1872 in this district the Christians of all denominations only amounted to 7,867. It is however, quite certain that many were omitted. In 1881 the number of Christians had risen to 18,191, of whom only 11,510 were Baptists. Wesley Church, the first Methodist Church built at Mandalay, near the Palace, in 1896. The Wesleyan Mission to Burma started shortly after the annexation of Upper Burma in 1886. The pioneer missionaries W. Ripley Winston and Arthur H. Bestall established a mission in Mandalay in 1887/8. ​Photo by Rev'd. H. Crawford Walters, missionary from 1910-1916 and 1918-1930. The distinction between these two sects is so slight that it is possible there may be some confusion in the return. It is more than probable that the few Episcopalians of whom only one apparently survives, have been now shown as Methodists belonging to the Episcopalian Methodist Church in Rangoon. The following account of the Episcopalian Methodist Church in Burma is from the pen of the Rev’d. Julius Smith, the Minister of the Church in Rangoon:- “The advent if the Methodist Episcopal Church in Burma is comparatively recent. In June 1879 the Rev’d. J.M. Thoburn, D.D. (now Bishop Thoburn of Calcutta) came to Rangoon on an evangelistic tour and preached in the old Baptist Chapel, since pulled down. The chapel was freely offered for the purpose. The converts growing too much for the church, the City Hall was secured where at the end of his two weeks services a church was organised. The site of a church and parsonage was immediately secured in Fraser and Phayre Streets and buildings immediately erected and which are still occupied for that purpose. The Rev’d. R.E. Carter was appointed the first pastor of the church in June 1879 and remained one year. In June 1880 the Rev’d. Y.E. Robinson became pastor and continued till March 1886. His pastorate was one of activity and success. He erected a commodious building in Lewis Street for a Girls’ High School, this school and its beginning has had a good patronage and a career of usefulness. Mr Robinson also started a work among the sailors and founded the “Seamen’s Rest,” which still exists and carries on the work of its founder. ​Flourishing missions of this community also carry on work at Pakokku and Monywa in Upper Burma, the former under the superintendence of the Rev’d. A. Bestall and the latter under the Rev’d. A. Woodward. Attached to each is a promising Anglo-vernacular school under Government inspection.